What will be your favorite part of your family's Midwest vacation? It might be the visit to a prairie town, gazing up at four presidents on the side of a mountain, traveling 650 feet below the earth, or discovering a giraffe standing at your car's window. Follow this list of the top Midwest family vacation ideas your kids will love and get ready to make memories when you travel to the heartland. Before your visit, check with the attractions for hours, prices, and other up-to-date information. In addition to the attractions listed, also check for theme parks, amusement parks, and water parks for family fun. Illinois is a giant playground for kids and parents too. Enjoy a hassle-free day or weekend trip that won't leave the kids any time to complain about how there's nothing to do. View dolphins underwater or get up close to a polar bear. With more than 200 acres of zoo to roam, you'll also experience animal presentations, see thousands of animals, and get to play zoo where the kids can be a zoo director, veterinarian, or their favorite animal. Three floors and 13 exhibits give kids the chance to discover dinosaurs, invent their own gadgets, run their own town, and more. The Kids on the Fly exhibit, which lets children be a pilot, play air traffic controller and learn about airline safety won a Playful Travel Award from Nick Jr. Magazine. Play trains, doctor, chef, farmer, and more. Or just play. The museum has exhibits dedicated to teaching kids and playground areas where they can just be kids. It is located in Normal. Of course, the children will love it here. They can touch every exhibit, which includes water play, creativity exercises, movement activities, and math and science areas. It is located in Naperville. One of the oldest zoos in the country is in the heart of Chicago. There's a family children's zoo, bear habitat, birds of prey exhibit, nature boardwalk, and more. Just how many different types of water creatures can you see in one place? How about 32,500 at this Chicago aquarium. Whether you feel the need for speed or like to slow things down with a leisurely walk through the zoo, Indiana's lineup of family fun has you covered. With four levels of exhibits, you can guarantee the kids won't get bored. The dinosaurs exhibit, biotech learning center, planetarium, and trip to Egypt are a small sampling of what the museum has to offer. Housed in a former fire station, the museum features a collection of artifacts and vintage fire trucks dating back to the 1800s. A visit to the museum is also a lesson in fire safety. Even the non-racing fan in your family won't leave without smiling if you take them to the famous track in Indianapolis. The Hall of Fame Museum is all about things that go vroom. About 75 vehicles, from Indy cars to vintage convertibles, are on display. Bring your comfortable walking shoes. This zoo's massive grounds will burn some calories while giving the family about 4,000 animals to see. Visit hundreds of animals at Indiana's oldest zoo. It has a seasonal schedule and is located in South Bend. Permanent and temporary exhibits let kids explore the world of science through hands-on projects. A special swap shop also allows kids to bring in their treasures from other cities and states to exchange them with other children. It is located in Fort Wayne. Car lovers young and old will appreciate the history of the Studebaker family, along with vintage cars and artifacts. It is located in South Bend. Pack up the family for a day or weekend trip that includes time with nature, screams on roller coasters, and a one-of-a-kind tour to watch motorhomes moving down the assembly line. There are 49 acres in this zoo neighborhood that's home to more than 100 species and about 1,500 animals. It is located in Des Moines. Use your day with the family to explore 2,526 acres. More than 200 sacred earthen mounds have been preserved with 31 of them in the shape of birds and bears. It is located in Harpers Ferry, a few miles north of Marquette. If you're looking for fun that's outside the norm, take a factory tour at Winnebago Industries. Located in Forest City, you'll see how the company's motorhomes are made as you stand on a catwalk and watch three 1,032-foot assembly lines move the motorhomes to each stage in the assembly process. Admission is free. Sign up for fun when you plan a day or weekend trip to one of Kansas' favorite vacation spots for kids. Learn about flying high in the sky, go 650 feet underground, or stay somewhere in between with one of the state's other family attractions. In Topeka, check out 33 aircraft from World War I up to now. Kids can sit in the cockpit of a real attack plane, explore the inside of a helicopter and discover aviation artifacts. Sports lovers young and old can view exhibits and memorabilia from Hall of Famers. Located in Wichita. What's 650 feet below this museum in Hutchinson? An underground salt mine that young explorers can learn about on a guided tour. Because of mine safety regulations, children under 4 are not allowed. Over 2,000 animals of 400 different species live at this zoo in Wichita. The zoo is usually open every day of the year unless special events are planned. About 55 acres of zoo adventure awaits in Garden City. More than 300 animals of 110 species are on display. Michigan caters to the little kid in all of us. With all there is to see and do in the state, children get to play and parents get to act their inner age. About 600 animals representing over 140 species live in this zoo. Located in Battle Creek, the zoo attracts hundreds of thousands of visitors every year. Live shows, a planetarium, and special exhibits open kids' minds to the world of science. An IMAX theater is also on-site. Feed the giraffes, ride the train or just look at the more than 1,500 animals covering 260 species. Affordable and fun are two words to describe this hands-on museum, which features permanent and traveling exhibits. Some of the activities available include grocery store playtime, a simulated bank and a magic mirror world that introduces kids to prisms and kaleidoscopes. Chimps, bears, lions, penguins and sea urchins are some of the new friends waiting to greet your family at this zoo with over 1,000 animals. It is located in Grand Rapids. Climb a wall. Play in the water. Act out on the drama stage. There are about a dozen exhibits that encourage the imagination to come alive. It is located in Albion. If the intrigue of viewing fire engines from 100 years ago doesn't pique your interest, there's no doubt visiting the birthplace of SPAM canned meat will. Let the kids slide down a pole just like a real firefighter. They can also view vintage firefighting equipment and fire trucks as well as learn about fire safety. Open Saturdays, weekdays by appointment for groups. It is located in Minneapolis. In Duluth, see more than 200 animals, birds, and reptiles on 16.5 acres. Lions, tigers, a Kodiak bear, polar bear and snow leopards are just some of the zoo's residents. The largest mall in North America isn't just for shopping. You'll also find a Nickelodeon theme Park, aquarium, dinosaur museum, LEGO Imagination Center, mini golf and even a wedding chapel if you want to renew your vows in front of the kids. It is located in Minneapolis. Kids are encouraged to play, discover, explore, learn and create at this hands-on experience museum. It is located in St. Paul. About 3,000 animals representing more than 500 species live at the Minnesota Zoo. Millions of dollars are continually poured into the zoo to create unique exhibits worth taking the kids to see. If you're looking for a quirky day of fun, spend an afternoon at the SPAM Museum. Admission is free to the 16,500 square feet of SPAM exhibits, games and vintage memorabilia in the city where SPAM was born in 1937. It is located in Austin. Play on land, water, or underground in Missouri with the kids. The Show-Me State offers unique experiences children and their parents won't soon forget. Explore the excavated side-wheel steamer, which was built in 1853. It is located in Kansas City. Over 1,000 butterflies surround you in the botanical garden along with tropical plants and beautiful waterscapes. There's also a Mirror Maze, 3-D theater and insect zoo. It is located in Branson. In St. Louis, kids can visit the grounds of the famous Busch family. The farm is operated by Anheuser-Busch but this day of fun is for the kids with 1,000 animals from six continents on close to 300 acres. The founder of Hallmark created this imagination station. Kids are encouraged to make whatever comes to mind with leftover materials from Hallmark. It is located in Kansas City. The 10th largest zoo in the U.S. covers 202 acres with more than 1,000 animals to see. An IMAX theater is also on-site. There's plenty to do all in one place. The discovery room taps into the budding scientist, a planetarium looks at space travel and special exhibits like the pirates' adventure and Darwin experience expose kids to fun and learning at the same time. With 5,000 animals to see, plus an insectarium, children's zoo, and a miniature train, plan to be at the St. Louis Zoo for at least the whole day. Catch feeding times for penguins, sea lions, tree kangaroos, and bears. Walk underground to discover the natural living crystal cave formations. It is located in Branson West. Splish splash in the water play area. Learn about farming. Roam around the outdoor garden. There are more than a dozen exhibit areas in this Kansas City children's museum. The kids won't be whining about how bored they are with activities that center around them. Nebraska also has plenty of attractions that appeal to kids of all ages, even mom and dad. Parents magazine ranked this zoo as one of the top 25. It has a seasonal schedule. The kids can touch everything over 60,000 square feet of exhibits designed just for them. Features permanent and traveling exhibits as well as special events all year long. Home of the world's largest indoor desert, an aquarium with over 1 million gallons of water, a butterfly and insect pavilion and more. An IMAX theater is also on-site. A large indoor play area and flight simulator rides work out a kid's energy. But the aircraft exhibits will give the whole family something to talk about on the drive home. It is located in Ashland. Creative play awaits as children are encouraged to play banker, firefighter, beautician, and veterinarian. There's also a toddler play area, science room, and craft area. The state may be best known for its beautiful landscape, but North Dakota has plenty of kid-friendly activities everyone can enjoy. Ride the carousel. Wear costumes. Make music. You can make a day out of your trip to this museum for kids in Fargo. Located in Bismarck, the Dakota Zoo filled with 125 species of birds and mammals and usually has new exhibits in progress. It has a seasonal schedule. Take a pony and stagecoach ride before visiting 24 buildings in this prairie town that houses antiques and artifacts. Also on-site are The Kirkpatrick Gallery, Louis L'Amour Writer's Shack and Northern Pacific Railroad Depot. It is located in Jamestown. Wow! That's what parents will say when they see the gem of attractions for kids in Ohio, and it's what the children will say after a day or weekend trip to one of these destinations. Will your favorite picture be the up-close shot of a giraffe, zebra or some other animal roaming about as you drive through this safari? Not only will you snap off some great photos, you'll also get to feed the animals from your car's backseat. It is located in Cedar Point, which is near Sandusky. Even grown-ups can be kids at this hands-on learning museum. Splash in the water or play in the toddler area inspired by Margaret Wise Brown's book, "Big Red Barn." What's it like to be in a tropical rainstorm? How long will it take you to get through the 1,800 square foot amphibian maze? You won't know until you visit the zoo and explore its 165 acres and 3,000 animals. With more than 165,000 square feet to explore, this science center features interesting exhibits that teach kids and parents alike about science. An IMAX theater is also on-site. It is located in Cleveland. You don't get to see carousel horses being hand-carved every day. There are also 35 rare carousel animals to visit and a ride on the carousel, of course. It is located in Sandusky. Discover a natural limestone cave and Ohio National Landmark more than 50 feet below South Bass Island in Lake Erie. On the surface of Perry's Cave, you'll find a family fun center that includes gemstone mining, miniature golf, a butterfly house, rock climbing wall, and antique car museum. Bring out your family's inner rockers. With 150,000 square feet to roam, enrich the kids' music appreciation and see all sorts of memorabilia from different eras of rock and roll. It is located in Cleveland. The staff is in costumes to teach you all about life in the 19th and 20th centuries. The seasonal activities include sheep shearing, craftsmen working in their studios and more than 45 historic buildings to see. It is located in Archbold, an hour west of Toledo. No matter how hot it is outside, this cavern that's 110 feet underground keeps a consistent temperature of 54 degrees. Also, check out the real gem mine on the grounds while you're there. It is located in Bellevue. Zoo babies and their parents, a butterfly conservation and aquarium are some of the creatures at this massive zoo with about 5,000 animals on-site. Historic. Natural. Fun for the whole family. A day or weekend trip to South Dakota will have you gazing up at wondrous sculptures on the side of a mountain or at a reptile haven you won't find anywhere else. When it's finished, the Crazy Horse Memorial will be the largest sculpture in the world. Right now, it's a mountain carving in progress that was started more than 60 years ago in the Black Hills. Plan your trip during the laser light show event. 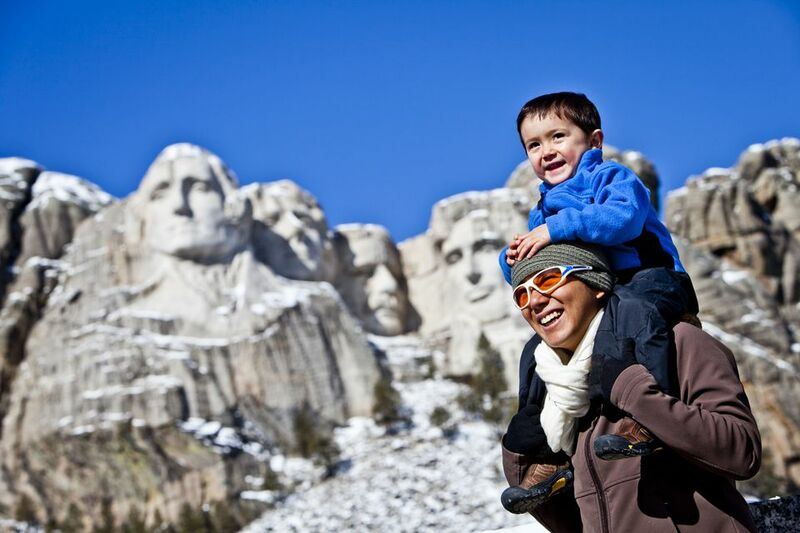 One of the most recognizable U.S. landmarks features the faces of George Washington, Thomas Jefferson, Theodore Roosevelt, and Abraham Lincoln. But there's also a ranger walk, kids' exploration area, evening program and more to round out a day of family fun. It is located in Keystone. This reptile haven in Rapid City claims to have more species of reptiles than other zoos or parks around the globe. Birds of prey, snakes, lizards, and turtles are some of the gardens' residents. How many kids can say they've visited one of the world's longest caves? More than 640,000 visitors explore the 28,295 acres full of wildlife, mixed-grass prairie, and natural beauty. Forget the cheese, Wisconsin could be best known for its variety of family activities. Climb a treehouse, crawl through the sky, and play with more than 72,000 moveable pins on a pin screen. It is located in Sheboygan. Exhibits include an aquarium, TechnoJungle, flight simulator and a 3-D adventure into outer space. It is located in Milwaukee. Thousands of mammals, birds, fish, amphibians, and reptiles live on 200 acres at the zoo. Be on the lookout for animals you can't see everywhere, including a Chinese alligator, vampire bat, Pacific giant octopus, and more. A mini train, giraffe encounter, aviary, and playground are some of the highlights of your family trip to the zoo. Of course, the stars are the 70 species of animals.